From the land of the Death to the land of the Living! Luxor! It was probably the most amazing city of the Egypt. It simply contains everything you ask from Egyptian history: the palace halls and gardens and on facades of nineteenth-century buildings, others from the British colonials and Egyptian monarchs, and more from beys and pashas of Ottomans! Furthermore you can watch an amazing sunset! It is also know as the city of the Living! It is built on and around the ancient site of Thebes. In the West Bank ( Ancient Thebes), there are The Valley of the Kings (Land of the Dead), The Valley of the Queens (which I could not see during my this journey) and The Colossi of Memnon. 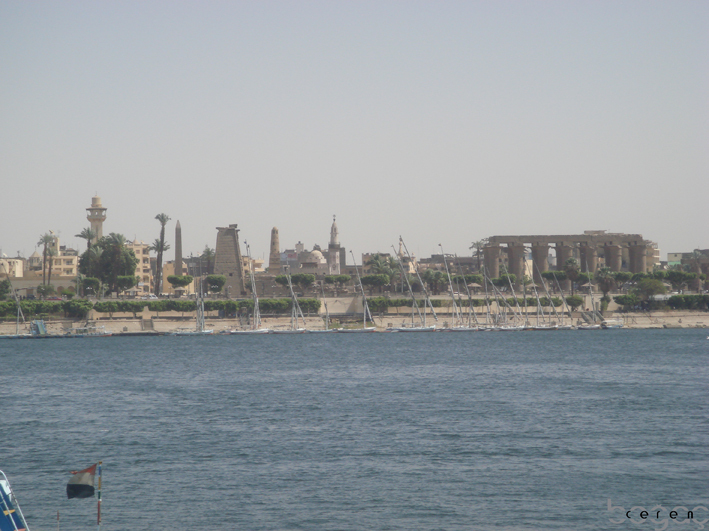 On the East Bank, there are Temple of Luxor and the Temple of Karnak. 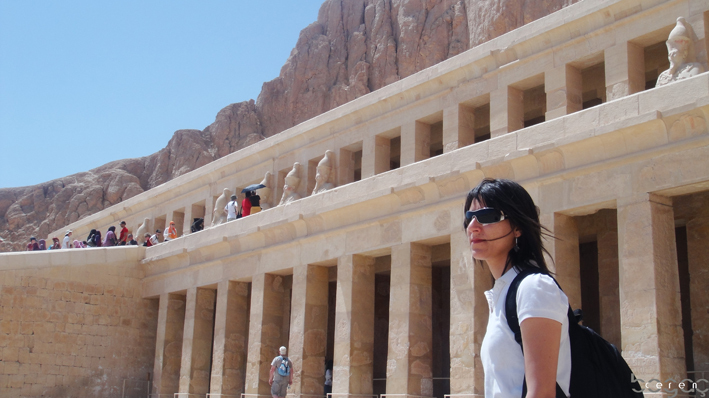 Valley of the Kings and behind the Temple of Hatshepsut: A Woman Touch to the Egyptian History! Hatshepsut, means Foremost of Noble Ladies, was the fifth pharaoh of the eighteenth dynasty of Ancient Egypt. She was the most power woman of the ancient Egypt! Most probably you all know that it was uncommon for Egypt to be ruled by a woman. However she became a successful ruler and left many monuments behind. She was the only female who is buried in the Valley of the Kings, yet her mummy has not been found. 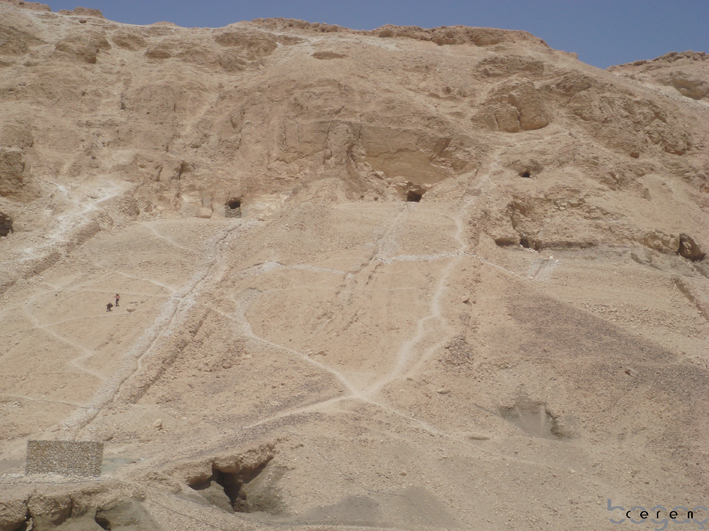 Picture 01: The Valley of the Kings- This area has been a focus of archaeological and egyptological exploration since the end of the eighteenth century. Today its tombs and burials continue to stimulate research and interest. 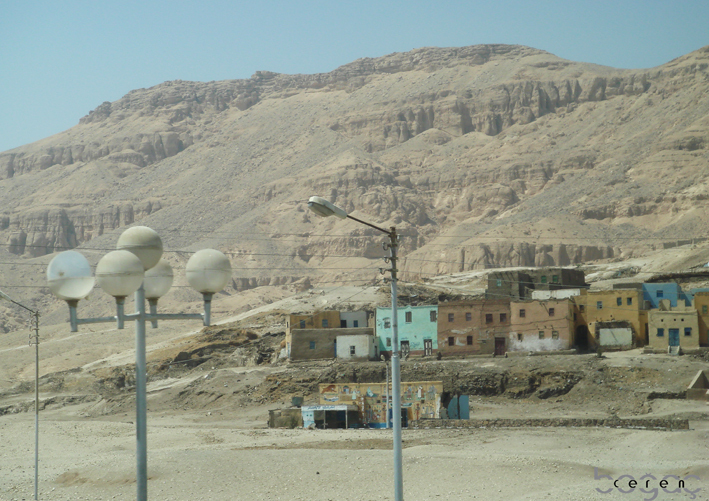 The valley became famous for the discovery of the tomb of Tutankhamun. It is considered to be one of the most famous archaeological sites in the world. In 1979, it became a World Heritage Site. It has soil of an alternating sandwich of dense limestone and other sedimentary rock. 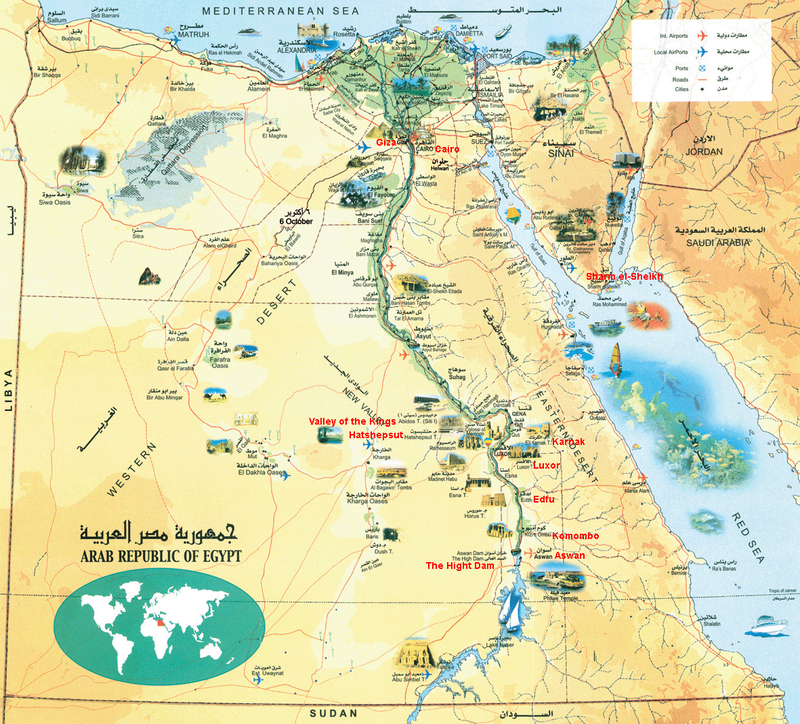 The water of the Nile cannot reach to this area, therefore Egyptians dig the earth to build tombs under. There are many tombs in this valley and yet many are to be discovered. You are not allowed to take pictures in this area- especially inside of the tombs which reserves many paintings and writings. I could visit only 3 tombs of the Egyptian kings and because of the legend of the curse over Tutankhamun’s tomb, I skipped that one! I saw his treasure in the Cairo museum and some pieces in Louvre- except thousands of years old mummy I did not miss any of him! Picture 02: Djeser-Djeseru is the main building of Hatshepsut’s mortuary temple complex. According to the records, it was designed by Senemut, her vizier (when you see their sculptures together, you realize that he was more than her vizier and might be her lover), the building is an example of perfect symmetry! They say that it predates the Parthenon. 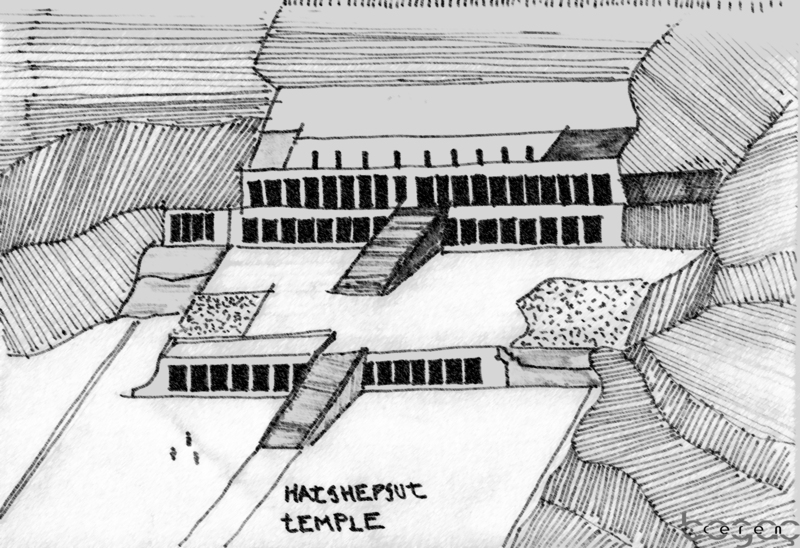 It is also the first complex built on the site she chose, which would become the Valley of the Kings! Here I also like to mention that this valley, like most of the mountains, look like shape of a pyramid. Therefore this land was chosen because of its association to a natural pyramid- the staircase to the heaven! This beautiful temple, which was different from the rest because of its grace, was sited top of series of colonnaded terraces, reached by long ramps that once were graced with gardens. 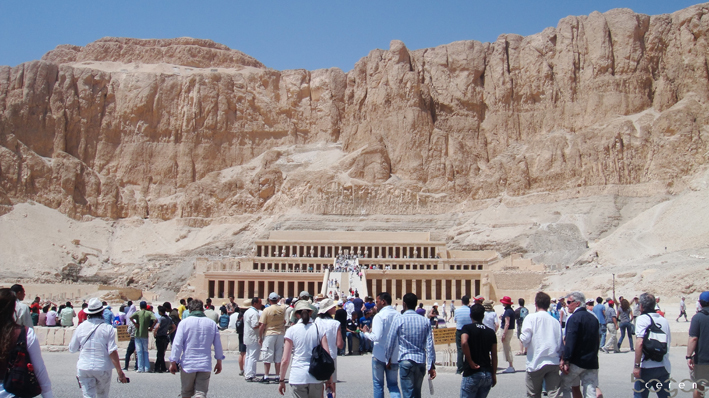 The temple’s construction was started by Tuthmose II and later finished by Queen Hatshepsut. When you look at it, after visiting many other Egyptian temples, you could easily say that there is a woman touch in its appearance. According to my travel book the walls of the temple depict major achievements such as the expedition to Punt near the Red Sea. This trading expedition brought back many riches for the country. The picture on the left: The records say that Hatshepsut had taken a strong role as queen to her husband and was well experienced in the administration of her kingdom by the time she became pharaoh. Sometimes she was represented as a male-figure with a false beard. His step son Thutmose III (who she send to take a military education during his early ages after his father’s death and she took the rule of the Egypt), carved her face off from many of her reliefs and sculptures, after he took the control of Egypt when he grown up. To me, she can be considered as a beautiful woman of her time (especially compared to Cleopatra!). 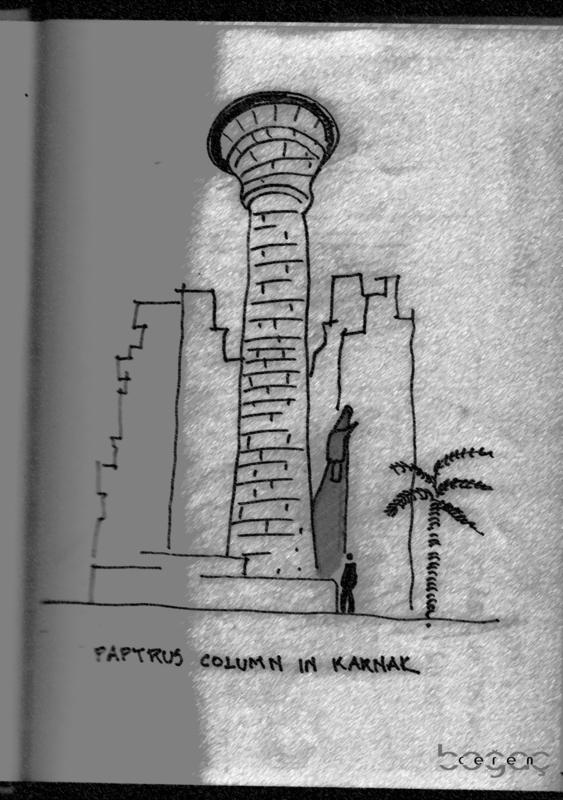 That is her portrayed on the columns. The picture on the right: The relief sculpture within Hatshepsut’s temple recites the tale of the divine birth of a female pharaoh – the first of its kind. She said to be invented of stories with the attachment to gods. She did this by making it appear as if the gods had spoken to her and her mother while in she was still in her mother’s womb- Amon-Ra had visited her pregnant mother at the temple in Deir el-Bahri. In this relief (as told by our tour guide) she associated herself with the goddess Hathor. Hathor licks the hand of an enthroned pharaoh-Tuthmosis III. 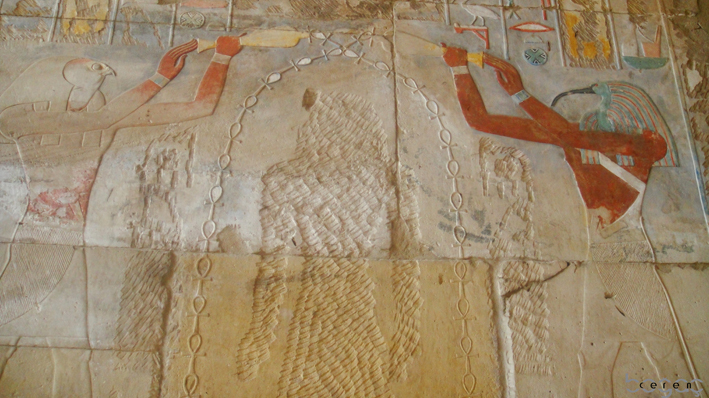 In the shrine of the Hathor Chapel, Hatshepsut is shown suckling one of Hathor’s udders, and at the end of the chapel Hatshepsut is shown seated between Hathor and Amun-Ra. Scarabs: A Symbol of Creation, Strength and Transformation! Well, I am sure that most of us do not like bugs. However, the Scarab personified the god, Khepri, a sun god associated with resurrection for Egyptians and therefore it was an important symbol. The large winged scarab and the heart scarab were considered good luck beetles and placed on mummies for protection against evil (You might remember from the movie “The Mummy” these bugs- yet they were nothing like as told in that movie!). Scarab beetles lay their eggs in dung, which they roll into a ball and roll into a hole. 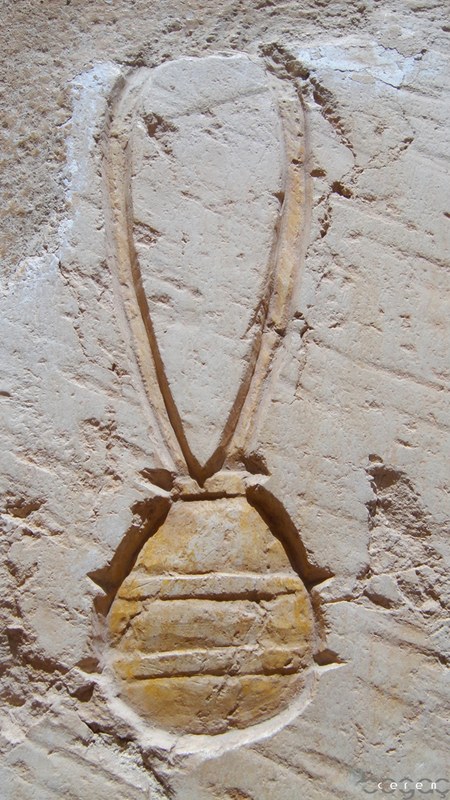 Ancient Egyptians believed that a winged scarab flew across the sky each morning carrying the sun. The scarab was a symbol of the rising sun and as a protector from evil; it is also a symbol of rebirth, regeneration, creation, transformation and was commonly worn to gain strength. Be sure that you get one of souvenirs of scarab to bring you good luck before you leave the Egypt! Picture 01: This was a bazaar next to the Mortuary Temple of Hatshepsut. 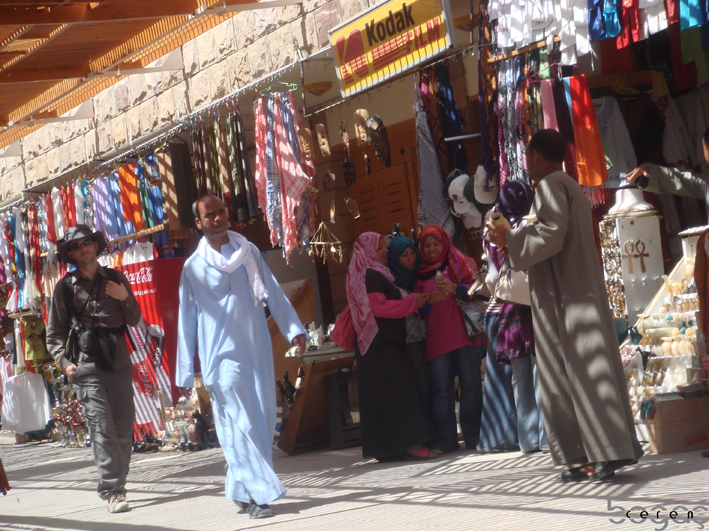 Bargain is a tradition in Egypt. You shall not buy anything without bargain. When you ask price of something it may start from 100 dollars and end up with 10! The worst part of it is; after you ask the price of something even if you walk away, the seller follows you and reduce the price with your every step. It was so annoying for me- even there were plenty of interesting things to buy I did not will to buy anything! 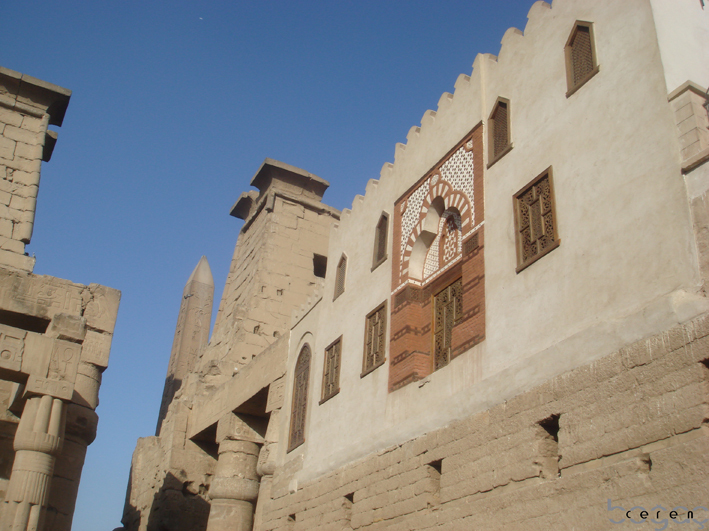 Picture 02: These are typical examples of mud-brick houses of the Egyptians. During the ancient times, all of the important buildings which were built out of granite were for the GODs, not for the mortals. Only the priests were the permanent habitants of these buildings. The palaces and regular houses of the kings were made out of mud-brick. Therefore almost none left from them. These statues where called the Colossi of Memnon in Greek times, when they decided that the colossi represented their hero, Memnon (I am sure you remember his from Achilles- a Greek hero of the Trojan War). These huge statues (19.5m), are the only part of the ancient mortuary temple built in Thebes by Amenhotep III (18th dyn) that remains today. According to a story told by our tour guide, in the ancient times, people were interested in hearing the sound (like crying) coming from those sculptures thinking that the gods are in their favor when they are able to hear the sound. Later on as it became an ancient phenomenon a Roman Emperor sought to repair the statues, inadvertently silenced the colossi of Memnon forever. The complex is a vast open-air museum and the largest ancient religious site in the world. The temple said to be built for god Amun-Ra, his wife goddess Mut and their son Khonsu- the god of the moon. It is an unfinished complex which continued to built over 2000 years! 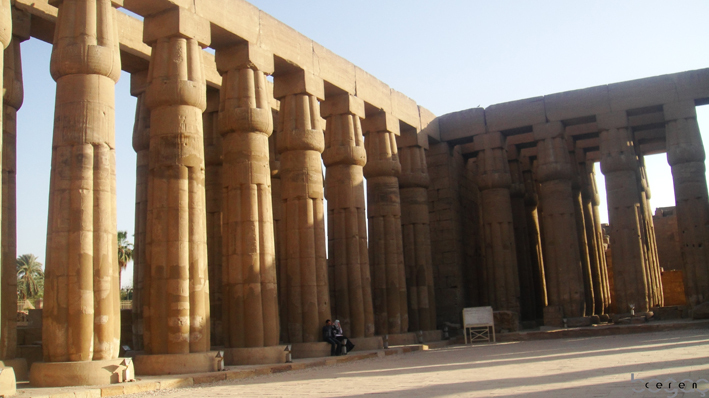 The temple building was begun in the 12th dynasty (1991-1785 BC) and was continued over centuries. Each Eyptian pharaoh had made another addition to the construction. The records say that approximately 30 pharaohs contributed to the buildings. 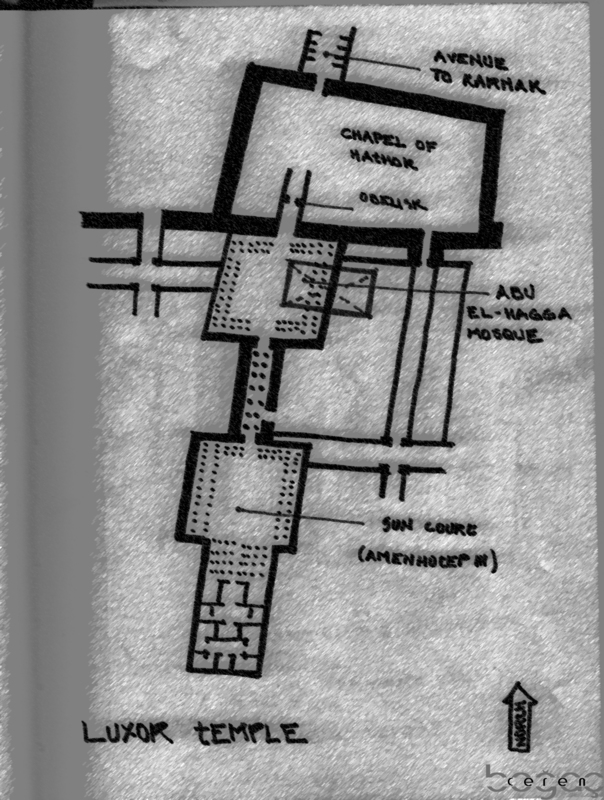 In this complex, The Temple of Amun-Ra, is situated in the center; The Temple of Monthu is on the north of the Temple of Amon-Ra; and the Temple of Mut is on the south. There are also small temples around the complex and next to Amun-Ra (inside of the enclosure wall) there is the Temple of Ptah- the creator god of Egypt who brought all things to being by thinking of them with his mind and saying their names with his tongue! There is a 20m high mud brick enclosure wall, which surrounds the temple complex. Picture 01: This is the visitors entrance of the temple complex. 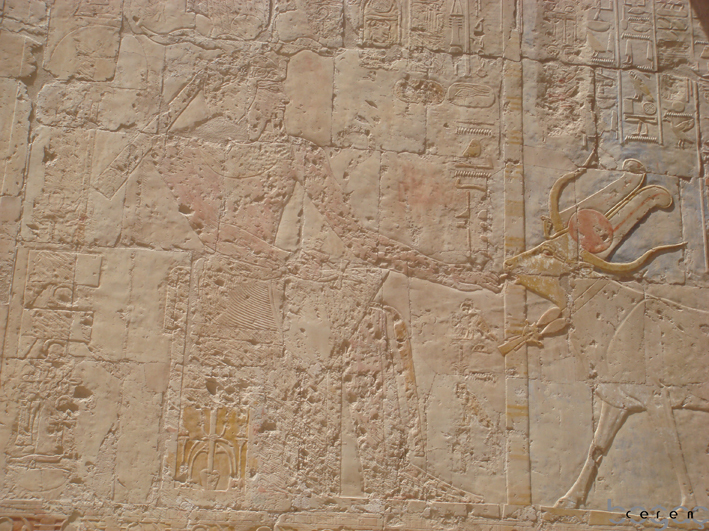 There is a avenue of Ram-headed lion-bodied sculptures (sphinxes) – symbol of the god Amun-Ra! 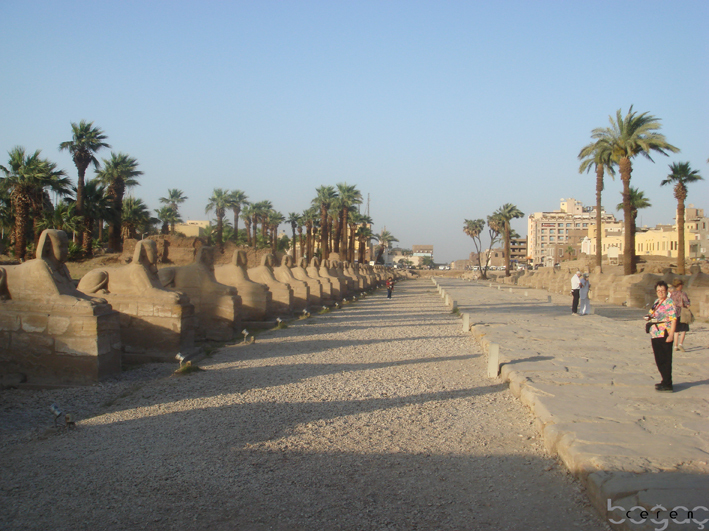 Recent excavations showed that this Avenue of the Sphinxes, or Sacred Way, was once stretched the two miles from Karnak to Luxor Temple. During my visit, I saw that they were making more excavations to bring all way to the surface! However I shall point out that, these ones were took here later as a decoration. 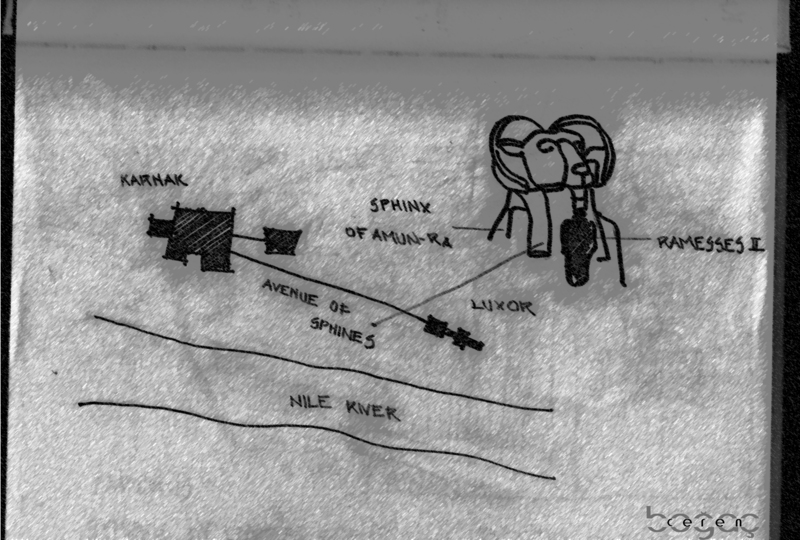 This is not the original location of the Avenue of the Sphinxes! Picture 02: Leaving the hypostyle hall through the third pylon (the picture right- down) you come to a narrow court where there once stood obelisks.There are two obelisks still standing at Karnak. 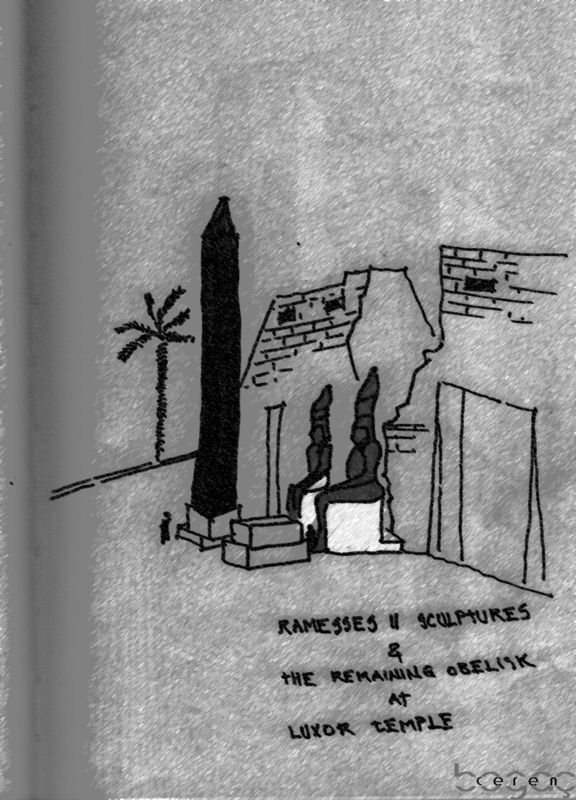 One of the obelisks was erected by Tuthmosis I who was the father of Hatshepsut. It is 21.3m tall and weighs about 143 tons. One of the remaining obelisks apart for that one was Hatshepsut’s which is It 29.6m high and weighs approximately 320 tons! 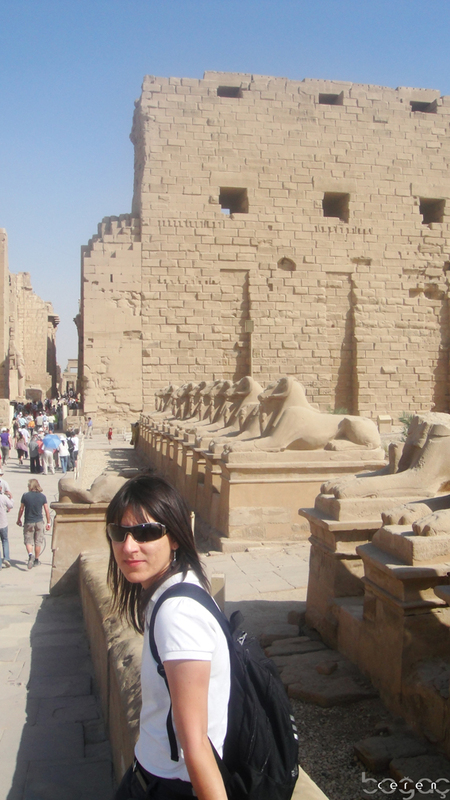 The picture on the left: This is me so happy to finally visit the home of the god Amun-Ra! He was my favorite Egyptian god for years. However when I was in Egypt, I realized that unlike most other gods, Amun-Ra has no legends or miracles to impress his worshippers! On his sphinxes, there was a statue of a Pharaoh under Ram head (my travel book wrote that we know it was Rameses II; because the statuettes between the sphinxes paws bear his cartouche). 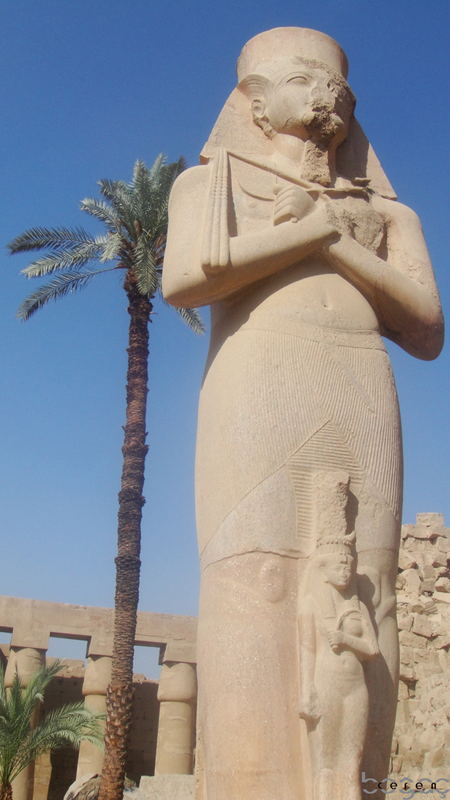 The picture in the middle: This is the huge statue of Pharaoh Ramesses II with a tiny statue of his daughter Bent’anta between his feet (confirmed by my travel book!). (Funny that our tour guide told us that it is his royal wife Nefertari – even the Egyptologist may sometimes mix it up!). The picture on the right: “Hippostyle Hall”- this is the first courtyard that welcomes you when you enter to the temple. It consis of 134 columns. 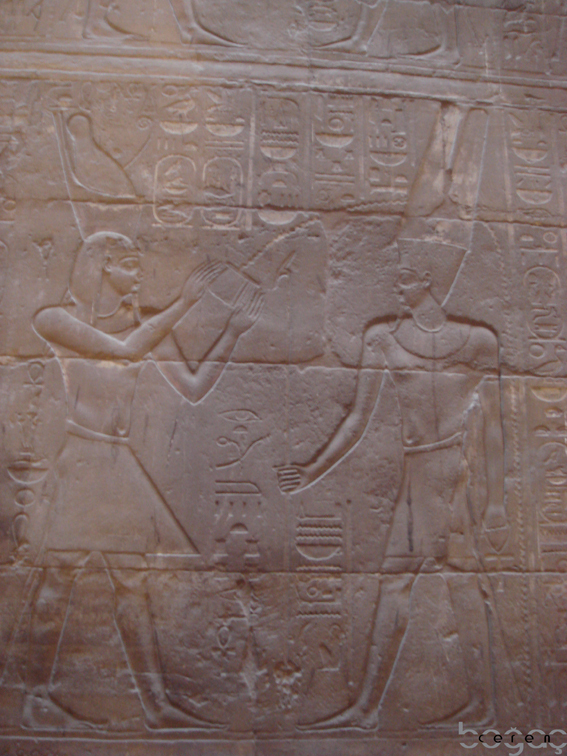 It was said that the hall was started to built by Seti I, but the majority of the construction was done by Ramses II. The center columns are taller than the others; this way the windows would allow light to come in. The columns and walls of the temple are covered with paintings and reliefs, which describe in pictures and hieroglyphs the life and heroic deeds of the pharohs, as well as rest from the Egyptian mythology. The picture on the left: Guess who’s figure was taken out from this relief??? If you cannot guess, please go back to read the first title of this page! Yes yes, this is Hatshepsut – given the key of life, or in other words eternal life by the gods of Amon and Thoth may be? (This is my guess- you know all of them looks like each other!). 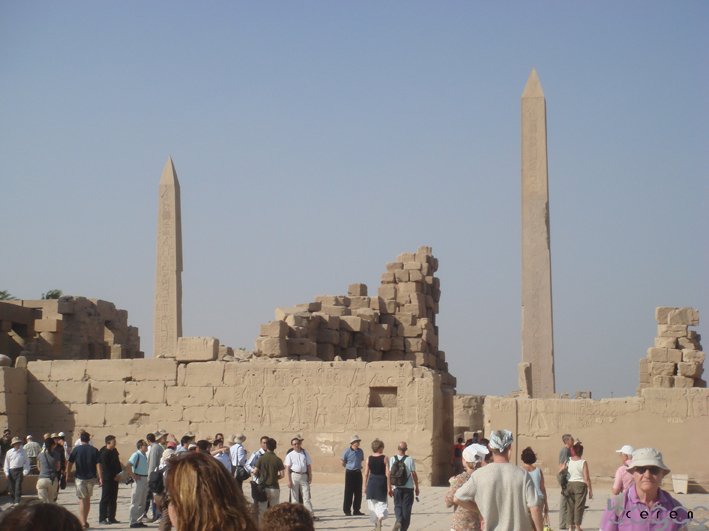 The picture on the right: Every Egyptian temple had a sacred lake, and the one at Karnak Temple was the largest. The lake was used daily by the priests for purification. During the festivals Egyptians believed that the images of the gods would travel across the lake in boats (I saw some of those boats in Edfu Temple). It was written that the lake measures 130 x 77 meters and was surrounded by storerooms and homes of the priests. During the ancient times many festivals were celebrated in Thebes. 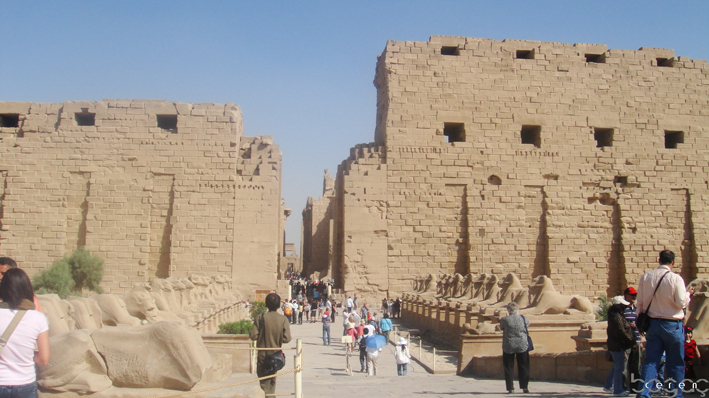 The Luxor Temple was the center of the most important one, the festival of “Opet” (meaning the “private sanctuary”).A procession of the current royal family was taking place began at Karnak and ended at the temple of Luxor. It was said that by the late 18th Dynasty, the journey was being made by barge, on the Nile River. Each god or goddess was carried in a separate barge that was towed by smaller boats. Large crowds consisting of soldiers, dancers, musicians and high ranking officials accompanied the barge by walking along the banks of the river. 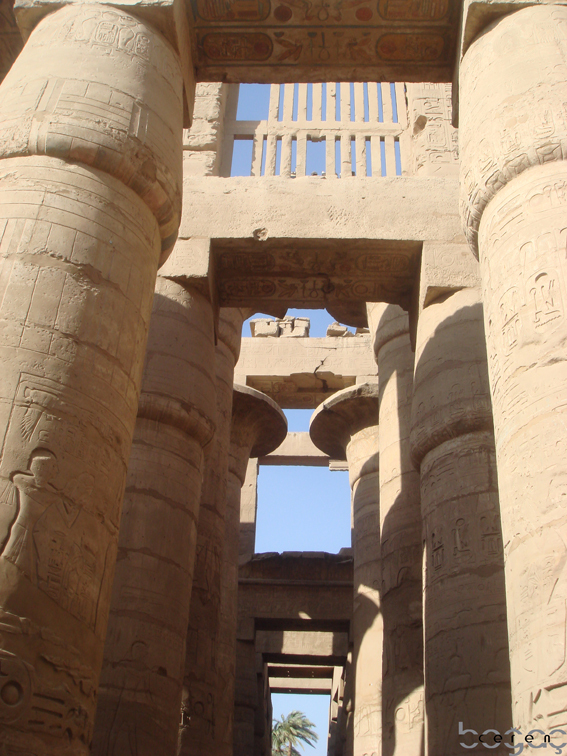 Most of the parts of the temple were built by Amenhotep III and Ramesses II. 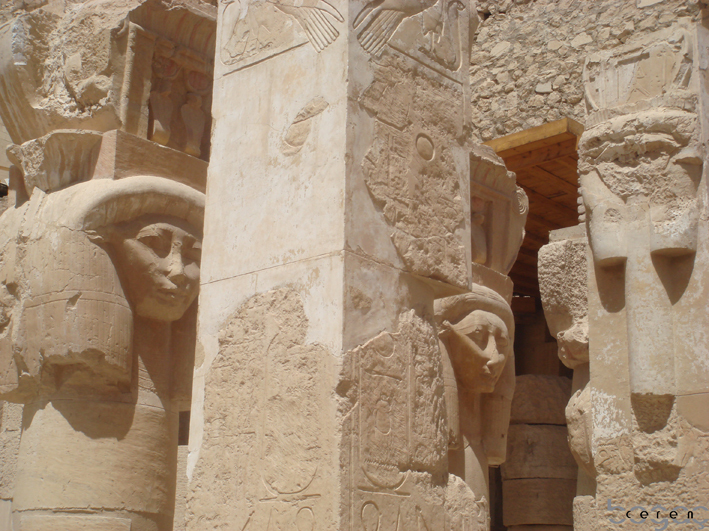 Just like the Karnak Temple, Luxor temple was also dedicated to t Amun-Ra, his wife Mut, and his son Khonsu.During the Christian era the temple’s hypostyle hall was converted into a Christian church. 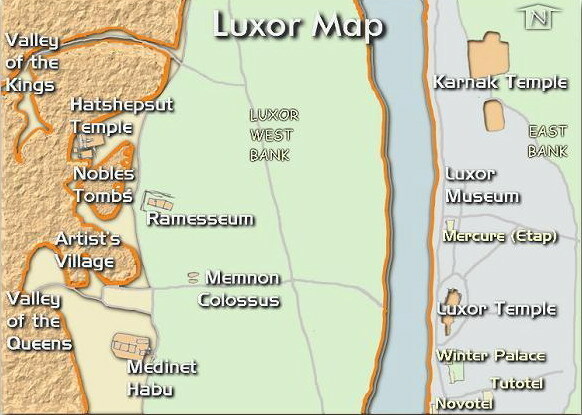 The temple of Luxor is close to the Nile and parallel with the riverbank. This is “The pylon”, in other words the temple gateway, and the first big court at Luxor Temple, which was built during the reign of Ramesses II as northern additions to the earlier temple of Amenhotep III. In Egyptian architecture pylon is a massive facade temple consisting two towers that are joint by gate- which is unfortunately has ben demolished in Luxor Temple. This pylon was 65 meters wide. 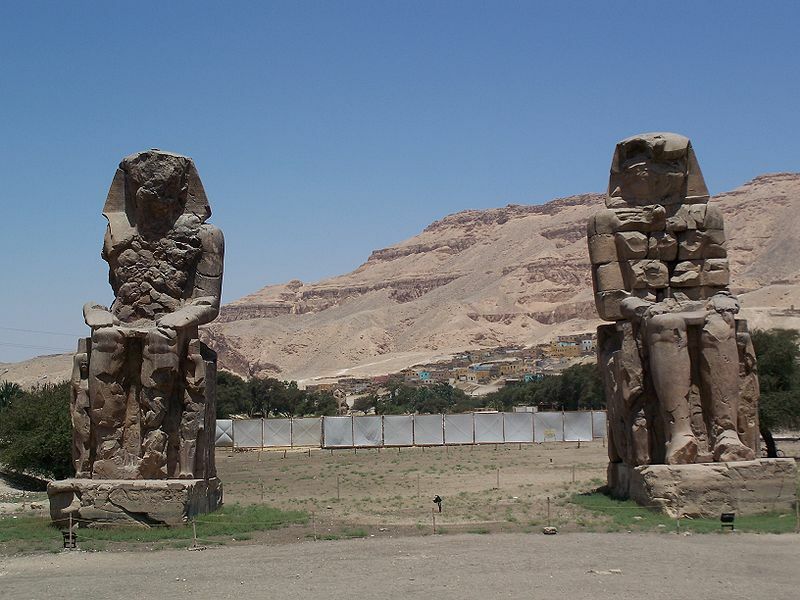 Two massive seated statues of Rameses II guard the pylon. 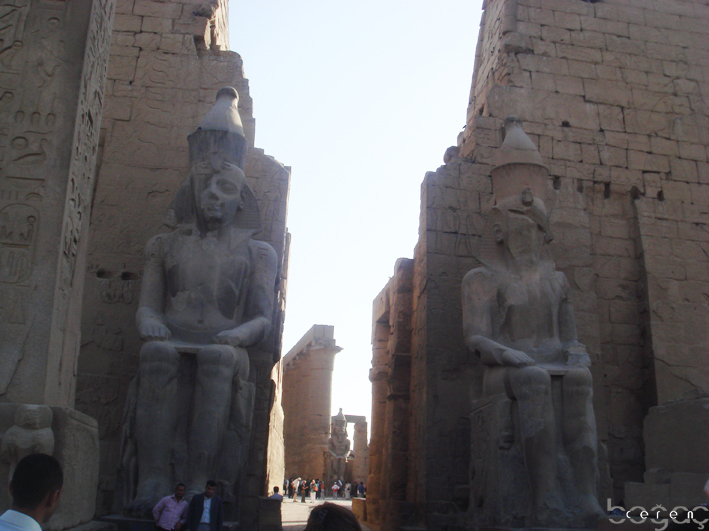 There Two massive seated statues of Rameses II guard the pylon. There is also one of (25m) two obelisks once accompanied them but today only one remains. The other obelisk is in the Place De La Concorde in Paris. The picture on the right: This is the great Court of Rameses II. It is said to be 57 meters long and 51 meters wide. Seventy four papyrus columns, with bud capitals surround it and in the Northwest corner of the court. 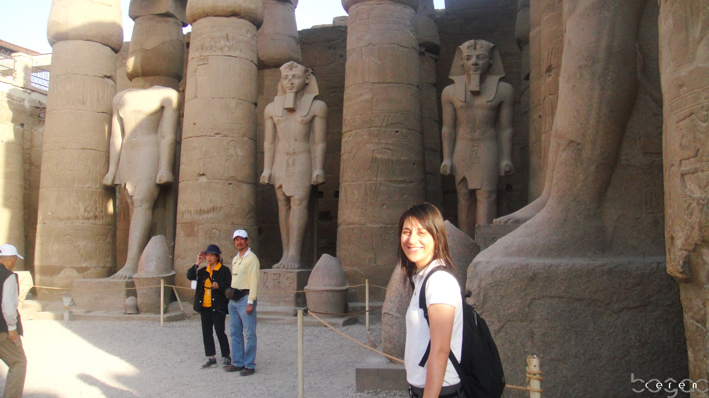 In the southern part of the court there are a number of standing sculptures of Ramses II. The east side of the court is now partly occupied by the Mosque of al-Hajjaj- which was built on the temple’s remains ages ago. This picture was taken from a barque chapel that was later converted into a shrine built by Alexander the Great and dedicated to the Amun-Ra. During the Roman times, the place was served as chapel where local Christians were offered a final opportunity to renounce their faith and embrace the state religion.The Roman stuccoes can also be seen atop the Egyptian carvings in this temple. 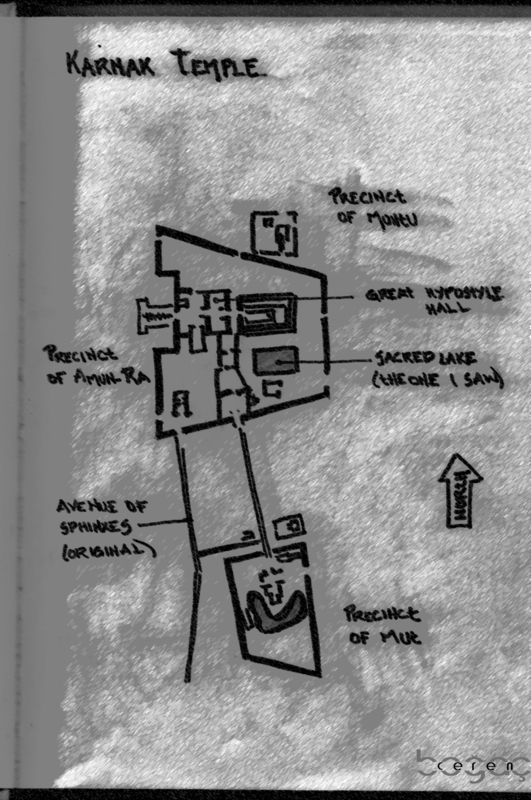 During the reign of Alexander the Great, he built a sanctuary for Amun-Ra in the heart of the temple. This scene represents Alexander the Great, dressed as a pharaoh, entering, receiving the two crowns, and offering rites. 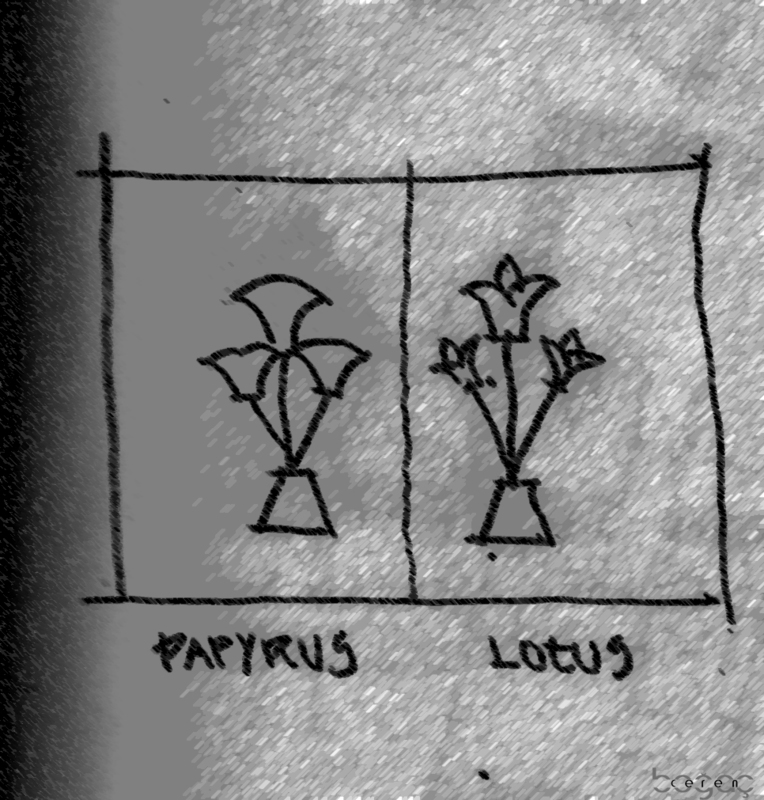 The picture on the left: A double image of Ramses II holding the knotted lotus (symbols of Upper Egypt) and papyrus (symbol of Lower Egypt). 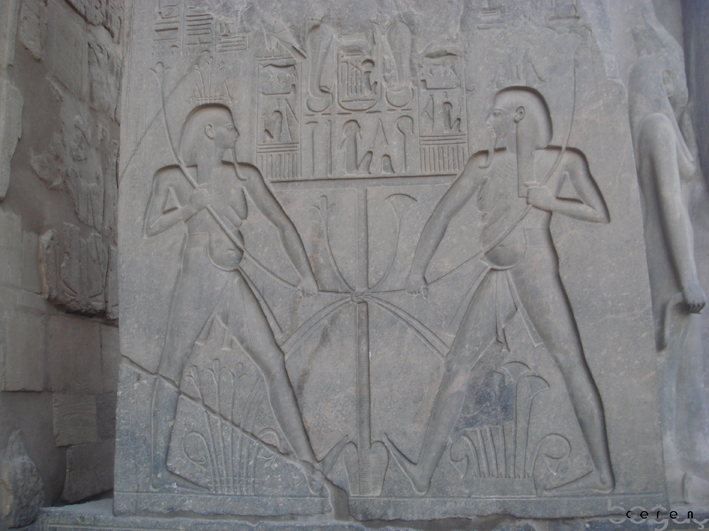 This image also represent the balance brought by the pharaoh to the land of the Nile. I think this was the one of the most beautiful image of the whole Egyptian history. This is one of the perfect example of low relief within a sunk outline (projecting image with a shallow overall depth). The picture on the right: For thousands of years, the temple was buried beneath the streets and houses of the town of Luxor. Here you can see a mosque built over the ruins (Abu el-Haggag Mosque- 13th century). It continues to be used today. You can see a red granite obelisks originally stood in front of the first pylon which was the remaining one of two. It is more than 25 meters high, therefore very visible even from far. 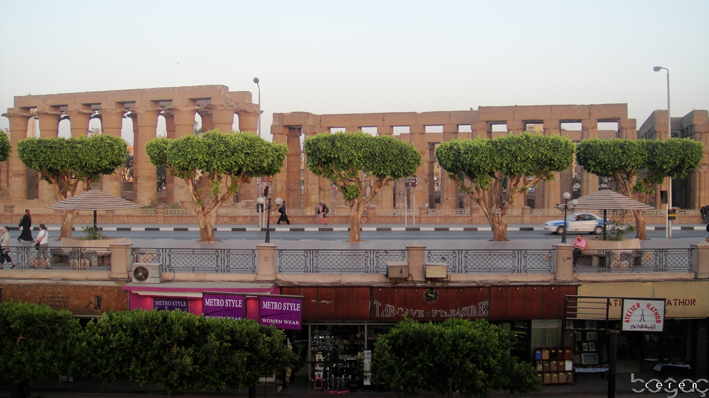 Picture 01: This is the avenue of the Sphinxes which goes to Karnak Temple. The scientists are still trying to take bring it to the sunshine again by excavating the area. I should also note that this sculptures were added to the temple almost after 1000 years later! 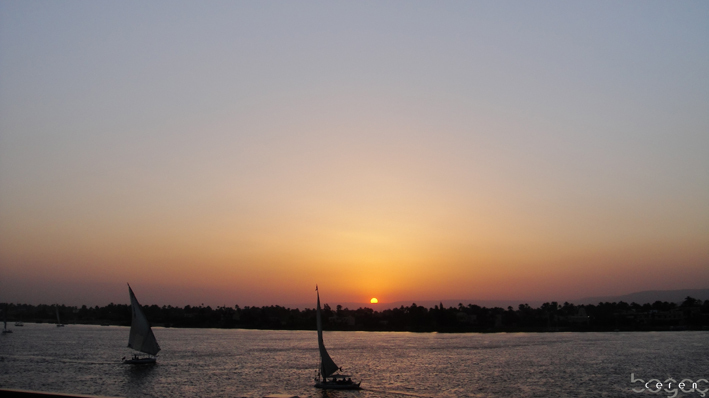 Picture 02: …And the sun goes finally down over the Nile! It sets over the land of the dead!